We all know that using recycled paper is better for the environment. But judging what the exact environmental savings are, isn't so easy. Thanks to our new environmental calculator, it's now easy to illustrate the detailed environmental savings you can make using our range of Xerox 100% recycled papers. Demonstrate your commitment to the environment now and see what impact your paper usage has on the environment. 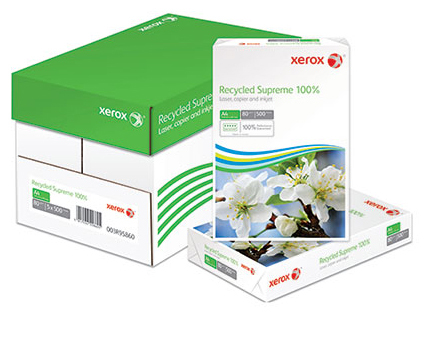 Why Xerox 100% recycled 80gsm paper? 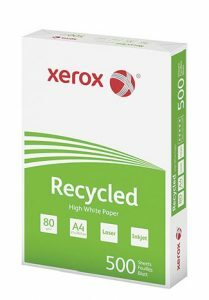 Xerox recycled paper is a low whiteness paper made from 100% Post Consumer Waste (PCW) and is ideal for everyday office or home printing. De-inked without bleaching and free from optical brightening agents (OBA). Wrapped and packed in recycled material. The table below shows the environmental savings that would be made by a typical business using just 20 reams per month (240 reams per annum). 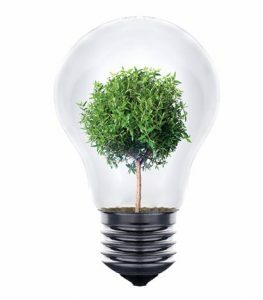 Sources : Water and energy savings are based on a comparison between a recycled paper manufactured at Arjowiggins Graphic mills versus an equivalent virgin fibre paper (BREF data for the non-integrated production of a wood-free paper). CO2 emission savings correspond to the difference between the emissions generated by a specific recycled paper and an equivalent virgin fibre paper, both produced in an Arjowiggins Graphic mill.